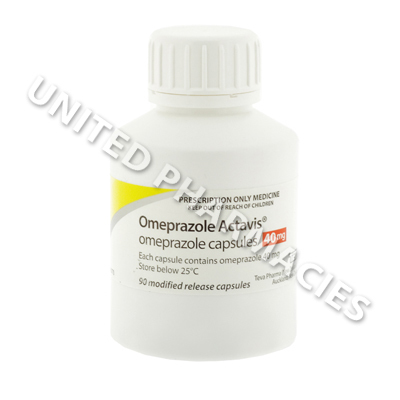 Omeprazole Actavis (Omeprazole) is prescribed to treat acid reflux disease, heartburn, or ulcers. It works by decreasing the amount of acid produced in the stomach to prevent any excess from degrading the stomach lining or entering and damaging the esophagus. 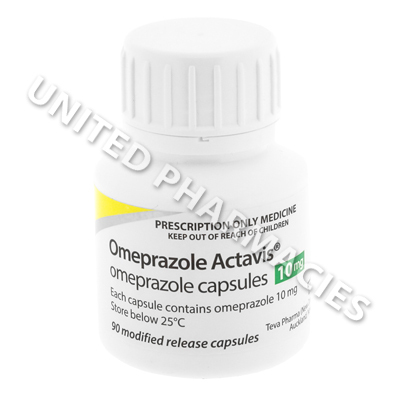 Omeprazole Actavis (Omeprazole) is a proton pump inhibitor prescribed to treat acid reflux disease, heartburn, or ulcers. It works by decreasing the amount of acid produced in the stomach to prevent any excess from degrading the stomach lining or entering and damaging the esophagus. This medicine may be prescribed to be used along with other medications or to treat other unlisted conditions. Always follow your physician`s instructions when using Omeprazole Actavis (Omeprazole) for the safest and most effective results. It is typically taken once each day, but your dosage and frequency of application will be determined based on your current health condition, symptoms, and your response to any previous treatments. Follow all instructions given, as misuse could lead to unexpected health problems. Swallow your daily doses whole, and wash down capsules with a large glass of water. Dose on an empty stomach to aid absorption of the medication. Never split, crush, chew, or dissolve the tablets to prevent changing their effects by disturbing their timing of release. It is also advisable to take your doses at the same times each day for best results. Attend all appointments with your physician while taking this medication so that your response to treatment may be monitored. You prescription may be adjusted based on your progress. As with any medical treatment, the use of Omeprazole Actavis (Omeprazole) may cause side effects in some patients. These can be mild or severe and should be disclosed to your physician as soon as possible to make sure the correct response is taken. Omeprazole Actavis (Omeprazole) should not be used if you have an allergy to its active ingredient or if you have had a bad reaction to similar treatments in the past. It is important to tell your physician if you have decreased liver function as this may require a reduced doses or other changes to your prescription in order to prevent potential health problems from ocurring.